Gold is on the run again as the performance of the greenback took a hit. Fundamentally, the intensifying U.S.-China trade dispute is the driver ahead of next week's FOMC meeting. We believe that US Dollar bulls were left on the sidelines when President Trump announced his $200B tariffs on Monday that provoked an expected and swift retaliation from the Asian nation. We can now say that Gold seems to again behave as a safe haven instrument after some time. 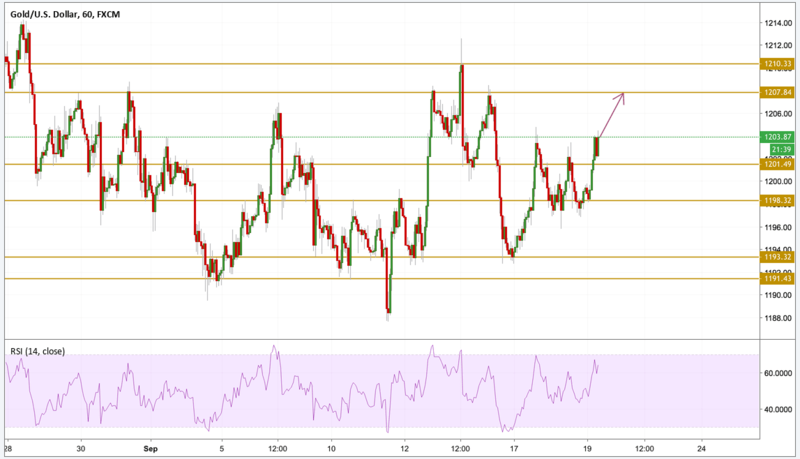 Gold prices have been in another bumpy ride but managed to find support at the $1197 level and are currently digging their way up to retest recent highs. Momentum is strong as we can see on the RSI chart but we have to watch out for overbought conditions. The next level we will be focusing on is the $1207.84 resistance level.